Last week, students in Mrs. Moore's Dance 2 class had the opportunity to learn from two master teachers who are experts in their respective styles. 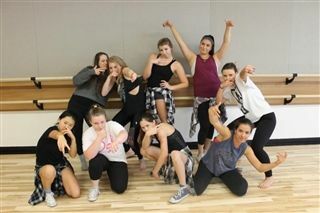 Gabby Esquivel and Hannah Webb, both teachers at Pacific Motion Dance Center in Carlsbad, stopped by to teach hip-hop and contemporary dance. The teachers helped the students refine their technique and skill, and to learn, practice, and perform new choreography with expert guidance.